While the governor has touted his plan as a way to stabilize state tax revenues, it would actually do the opposite. “The most important thing we are accomplishing is stabilizing the finances of the state,” Illinois Gov. J.B. Pritzker said at the March 7 press conference rolling out his proposal for a graduated, or progressive, income tax. But a graduated income tax structure would actually make Illinois’ moving revenue target even harder to hit. 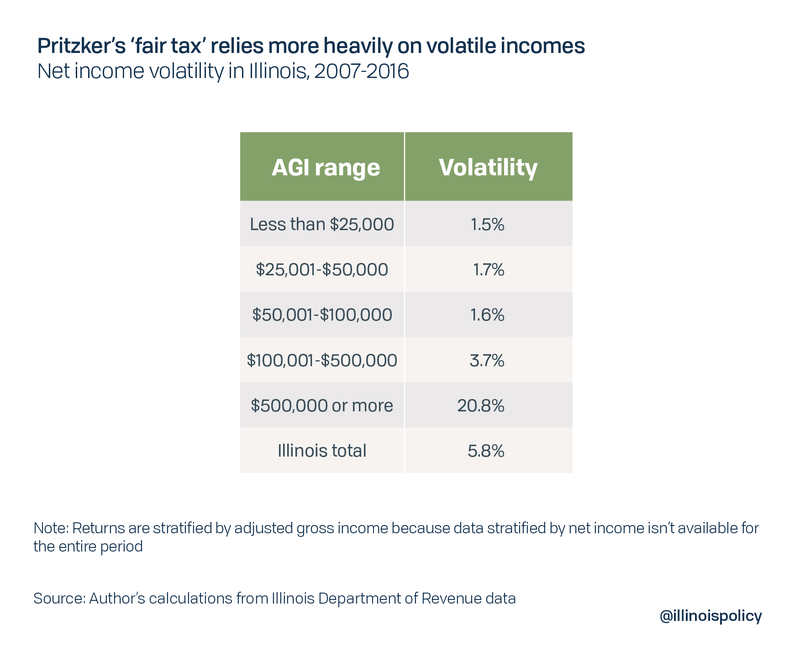 If Illinois had adopted the governor’s progressive tax rates in 2007, income tax volatility would have been 30 percent higher. 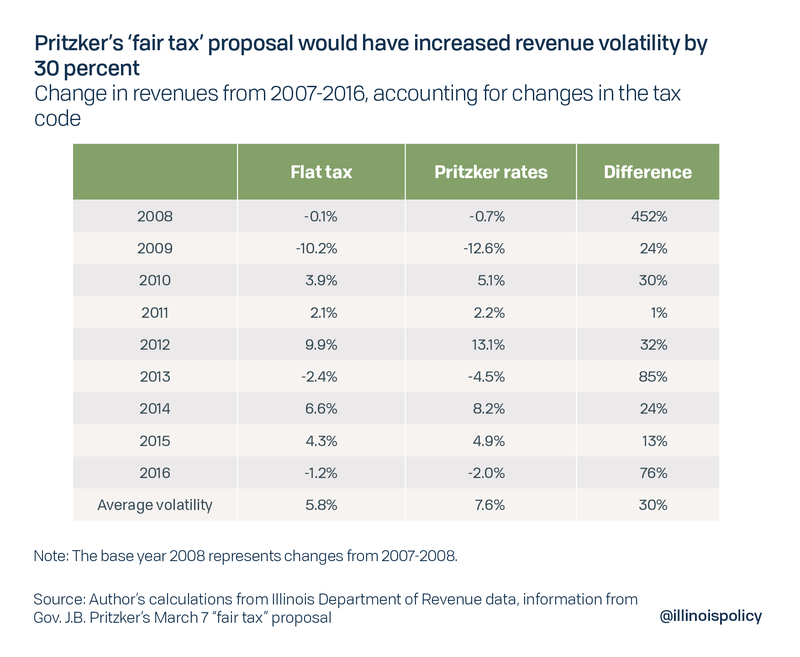 Larger swings in income tax revenue would make state finances less stable, harder to predict, and increase the likelihood and size of Illinois’ already chronic budget shortfalls. Take the 2009 recession, for example. 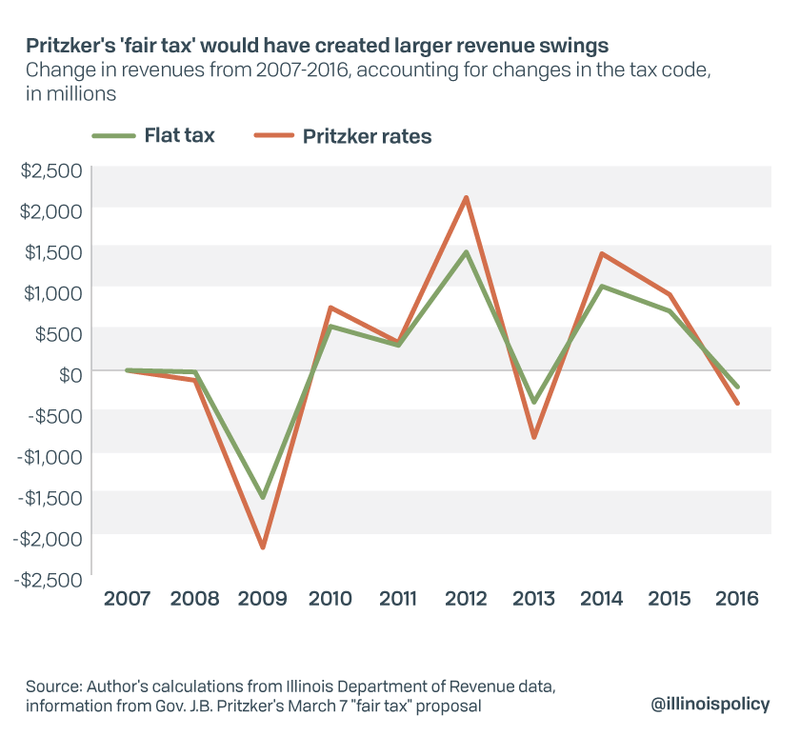 Illinois income tax revenues would have fallen by approximately $2.16 billion that year if Pritzker’s proposed income tax rates were in place – a 13 percent drop. But under the current flat income tax, revenue would have fallen by $1.55 billion – a 10 percent drop. That’s a $613 million larger swing in revenue in just one year. Why is a graduated income tax more volatile than a flat tax? With a flat tax, volatility in revenue comes from changes in net taxable income. But with a graduated tax, unpredictability comes both from everyone’s income changing as well as from different portions of people’s income being taxed at different rates and the swings being wider the higher the income bracket. This additional source of volatility results in higher tax revenue volatility when compared to a flat tax (see appendix). The governor’s tax scheme would be a less stable source of revenue than the state’s current flat tax. This is because Pritzker’s tax relies heavily on top earners, whose incomes fluctuate more widely with the economy. Why does volatility matter? Assume the state anticipates $3.5 billion in additional tax revenue from all Illinoisans under a flat tax. You could reasonably expect total income growth to fluctuate by 5.8% a year, so your $3.5 billion growth estimate could be off by $200 million. However, if we rely solely on folks making more than $250,000 for the new revenue, then the shortfall in tax revenue could be more than $700 million. This is because higher income brackets see much larger swings in income growth – up to 20.8 percent – than the lower brackets and are responsible for an even larger share of the revenue. Losing $200 million is tough, but losing $700 million is a crisis. Corporate income taxes are the most unpredictable and susceptible to change, followed by personal income tax, with sales taxes being the most stable. Progressive income taxes are also more volatile than flat income taxes because they rely on a smaller tax base that includes more income from investment, or capital gains, which fluctuates more with changes in the economy. In fact, revenue volatility has been increasing nationwide since 2000. This increased volatility is mostly driven by more volatility in capital gains and an increase in the percentage of income from investments, as opposed to wages. 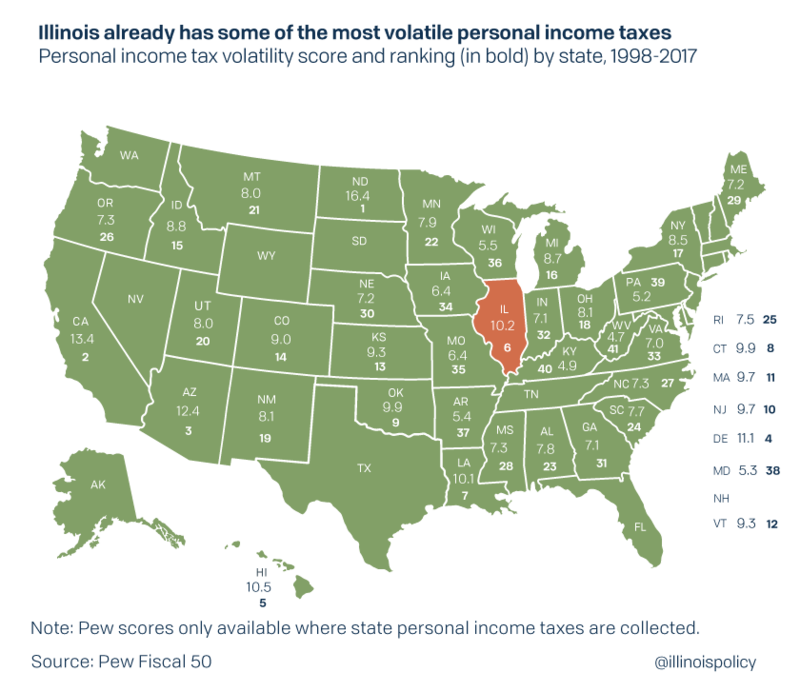 This would be particularly bad for Illinois: its personal income tax revenues are already more volatile than most other states, according to The Pew Charitable Trusts. Increasing the state’s reliance on corporate and progressive individual income taxes will make future revenues less stable, harder to predict and could lead to even larger budget shortfalls. Those budget shortfalls will require middle class tax hikes – that’s because the middle class makes up a larger share of taxpayers and their incomes are more stable.